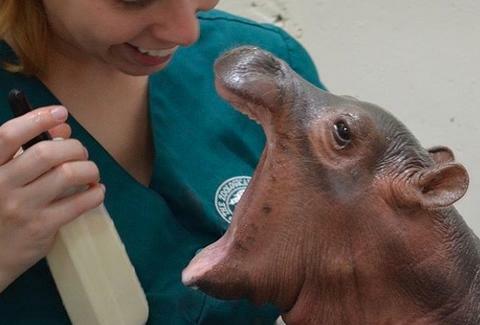 In late January, the Cincinnati Zoo shared Fiona with the world, though she didn't have a name at that point. She's their brand new baby hippo, born six weeks premature. The zoo shared a video of her being given a bath and it was the kind of thing that made the internet audibly squeal. While the Patriots were mounting a massive Super Bowl comeback Sunday, Fiona was working on her first steps. The zoo posted a short video of the pudgy baby wobbling around her pen. Those steps were a big deal because Fiona was premature. She was too weak to stand on her own when she was born, which prevented her from getting milk from her mother. It's meant caretakers have been closely monitoring her while making sure she's close enough to her parents that they can hear and smell each other. Baby hippos are usually born somewhere between 55 and 120 pounds, but Fiona weighed only 29 pounds. That makes her 25 pounds lighter than the lowest-ever recorded birth weight for this species of hippo, according to the Zoo. Don't be too cool for it. It's a baby hippo. It's pretty great.